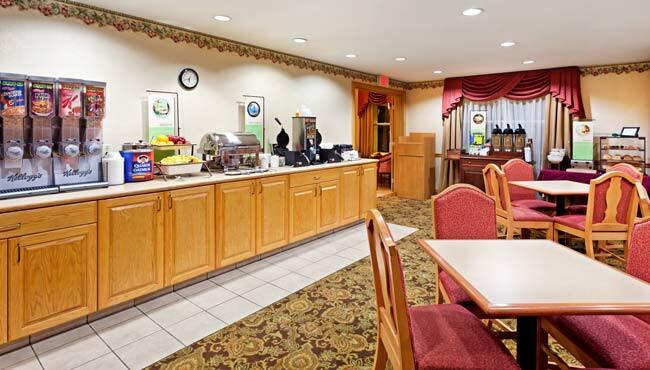 At the Country Inn & Suites near Hershey, we offer an impressive complimentary, hot breakfast, served daily in our cheerful dining room. You can drizzle a Belgian waffle with warm syrup, dig into sausage and eggs, or satisfy your cravings for pastries, potatoes and cereal. Fuel up with fresh, fragrant coffee or a cup of cold juice on your way to a meeting. For lunch or dinner, take I-81 to Harrisburg or head to Hershey to dine at nearby restaurants like Hershey Road Family Restaurant and The Manor. Mon-Fri: 6:00 a.m. - 9:30 a.m.
Sat-Sun/Holidays: 7:00 a.m. - 10:30 a.m.
Grab-and-Go breakfast bags are available one hour before breakfast officially begins.